There were two basic style of Amfleet I passenger cars delivered to Amtrak in the mid 1970s. The primary body style was that of the coach style passenger car which consisted of 9 windows on either side. The other style is the cafe car which consisted of 7 windows on either side with a large space in the center for a bar. The re-tooled Walthers Amfleet I Amcafe comes in the style of the first bullet above. 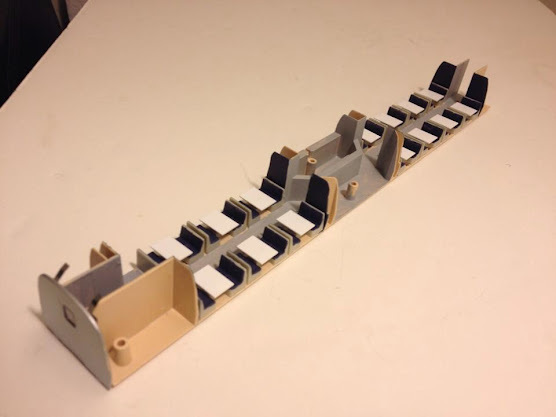 Currently there are no other offerings from Walthers that involve alternate interior configurations which prompts us to do a little bit of kitbashing to develop the remaining two confiugrations. It is important to note that Amtrak experimented with another configuration during the Captsone rebuild program which coincided with the heavy Acela marketing campaign in the early 2000s. 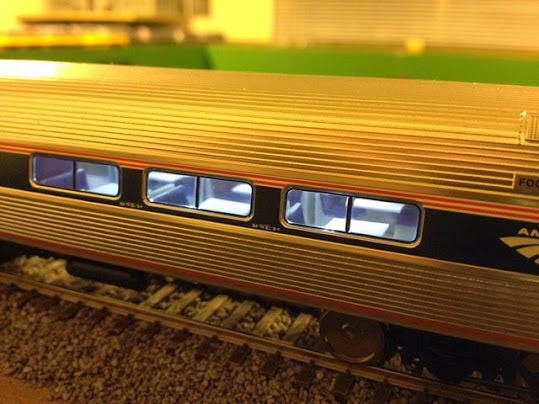 The attempt was to make the interior of the Amfleet Food Service car resemble the interior of the Acela cafe car. This was short-lived as Amtrak reverted back to the Amdinette configuration for its Northeast Corridor trains. This is the passenger car as-manufactured. One of the things readily noticeable out of the box is that the interior configuration is not what modern Amtrak modelers would expect. Hence the (optional) need to come up with a plan to re-arrange the interior. In order to get access to the interior, we must first unscrew the bottom of the passenger car in eight locations. The first locations are the couplers. Remove the mounting screws now as you run the risk of easily chewing up the area of the floor that those screws are mounted in. As such they will constantly fall out. Also unscrew these six locations which secures the shell to the chassis and interior. Before lifting the shell of the chassis, gently pry the end bulkheads off of the ends of the cars as shown in the picture. They are mounted in place by mounting tabs which press-fit into the ends of the cars. Remove the four screws that secure the interior to chassis. Keep track of these screws by screwing them (loosely) directly into the chassis. As we can already tell and confirm the seating arrangement is full coach seating on either side of the bar area. This means that all of the seats need to be ripped out. Unfortunately, the seats can not be easily removed as they are molded as one piece. To remove the seats we must us a dremmel, exacto knife and sand paper; in that order. After removing the seats we are left with this interior. At this point you can begin painting the interior based on the configuration of your choice. In my case I chose light gray in order to match the current interiors (2014) and the new seats which will be installed. I also painted the interior bulkheads by hand with CSX blue. After painting the base we can begin installing the new interiors seating. We do this with the help of Palace Car Company Cafe style booths. They line up perfectly with the windows as they are two-piece items consisting of two opposing facing seats and a table top. For one Amfleet cafe car, you will need a total of 14 booths and table tops. This requires two 10-piece sets or one 20-piece sets. In order to properly line up the booths, I recommend taking the shell and lining it up with the interior. Be sure that the backs of the booths line up with the ends of the windows (one should not be able to see the sides of the booths through the windows). With the booths installed, we can then paint them. Depending on which era you are modeling, you may need to paint the booths a different color. In my case I was fortunate enough not to have to paint the whole booth. In order to simulate the cushioning based on the 2014 appearance I painted only the back and the bench. Make every effort to leave the top exposed as well as the sides, front and back. After the seats are painted, the tables can be installed. Make sure that both the both sides and tables are flush with the interior floor on the edge. I did manage to retro-actively paint the exposed areas of the interior that were unpainted. I believe that the combination of the light gray and the blueish LED tint give the illusion of a white interior. One can still use white if desired. If you prefer to do the Amclub configuration, this is where the two project diverge. Install six tables on the A-end of the interior (the shorter end) and 2-1 seating on the B-end. Keep in mind that the two seats should be located on the engineer side and one seat on the Fireman side. There should be six rows of chairs. The chairs are from Palace Car Co. I used the Parlor chair kit. The picture below is a closer look at the business class section of the Amclub. Notice the five rows of seating as well as the 2-1 seating arrangement. Once completed, this is what you get. As you can see, the tables stand out more against a light gray background. Although one would be tempted to stay closer to the prototype and paint the areas white, it would drown out the tabletops and make them less distinctive. On the other hand, the blue seats could also help. It's a judgement call you have to make when you decide to undertake the project. The second image shows the business class section of the Amclub car when complete.